Get a taste of the Candy Fairies series with this yummy boxed set that includes the first four books! 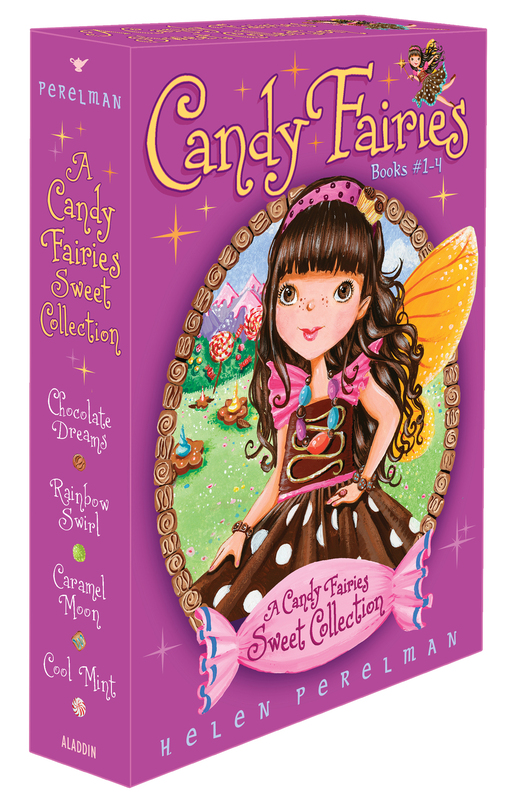 This supersweet boxed set of the first four Candy Fairies books includes Chocolate Dreams, Rainbow Swirl, Caramel Moon, and Cool Mint. In Chocolate Dreams, Cocoa the Chocolate Fairy is blamed for the missing chocolate eggs. But soon the other fairies discover that it’s the sour troll Mogu who is taking their candies—and they’re determined to stop him! In Rainbow Swirl, Raina the Gummy Fairy has her work cut out for her when a terrible storm hits Sugar Valley the night before the annual candy contest, and the colors for all the candies swirl together. What will Raina do to save the day? In Caramel Moon, the crop of candy corns is shrinking! Is someone playing a trick? Melli the Caramel Fairy and her friends will find out! And in Cool Mint, it’s Dash the Mint Fairy’s responsibility to make a new candy cane throne for Princess Lolli. But she seems more interested in going marshmallow sledding. Will she find a way to do both?